Grand Central, A Cathedral For Commuters, Celebrates 100 The largest railroad terminal in the world opened its doors for the first time in 1913. And while Grand Central Terminal, in the heart of New York City, no longer serves long-distance trains, it is still a vibrant part of the city's ecosystem. Grand Central Terminal opened its doors for business for the very first time 100 years ago Friday. The largest railroad terminal in the world is housed in the magnificent Beaux Arts building in the heart of New York City on 42nd Street. And while it no longer serves long-distance trains, the station is still a vibrant part of the city's ecosystem. Metro-North Railroad conductor Daniel Seven — who's just gotten off the local from North White Plains — walks past the gate and into the vast expanse of the main concourse, looking up at the cerulean blue ceiling, with its depiction of the constellations. "I see it on TV, in commercials and in the movies and — that's my office, you know?" Seven says. "And I feel very fortunate, very privileged to, you know, be here every day. ... It's a beautiful building." Seven is one of the 750,000 people who walk through Grand Central every day. To put it into perspective, that's more people than the entire population of the state of Alaska — a handy fact you can learn from Daniel Brucker, an enthusiastic New Yorker who's managed Grand Central Tours for the past 25 years. It's like a cathedral that's built for the people. We're not going through somebody else's mansion, through somebody else's monument. It's ours. It's meant for the everyday commuter, and it's a celebration of it. "To describe Grand Central Terminal, even to summarize it in one sentence, I would say that it's the kind of a temple, a monument to all that is great and fabulous in rail transportation, the type that God would've built if he had the money," Brucker says. Fortunately, the Vanderbilt family, who owned the New York Central Railroad, had the money. And what they built was a 49-acre rail complex with more tracks and platforms than any other in the world. The buildings on Park Avenue, to the north, are built over it. And it's an almost unfathomably busy place — during the morning rush hour, a Metro-North commuter train arrives every 58 seconds. "It's like a cathedral that's built for the people," Brucker says. "We're not going through somebody else's mansion, through somebody else's monument. It's ours. It's meant for the everyday commuter, and it's a celebration of it." "All you have to do is walk in or stand on the balcony and watch people move, and you'll recognize the genius of the people who built Grand Central," says Metro-North President Howard Permut. There were other Grand Centrals on the site — Grand Central Depot, the terminal's immediate predecessor, had an enormous Victorian glass and iron train shed, to accommodate steam from the locomotives. But in 1902, there was a terrible crash in the Park Avenue tunnel, with 15 fatalities. It was caused, in part, by steam obscuring the signals. New York state decreed that all steam trains be banished from Manhattan by 1908, and so the very new technology of electricity became an essential part of the new plan for Grand Central. 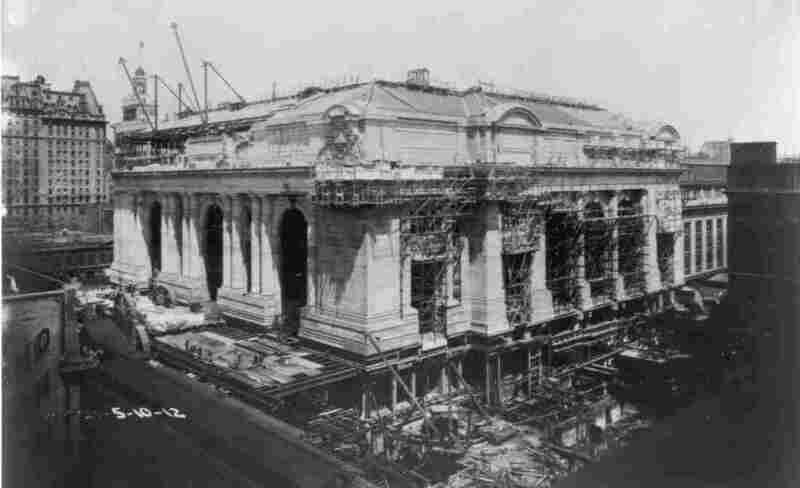 Construction began in 1906, while Grand Central Depot was still fully functioning. "They had to build the world's largest train terminal while handling more train customers, passengers and trains than any other train terminal or station in the world," Brucker explains. "And they had to build it all around there. That, in itself, was a marvel, was an engineering feat." And the final result was monumental, a space filled with light and architectural detail, says George Monasterio. He's the chief architect for the Metro-North Railroad, which now owns and occupies Grand Central. "It is the largest interior ... public space in New York," Monasterio says. The windows on the east and the west side, those windows used to open, they used to draw air from the east side, through the terminal, over and out the west side." 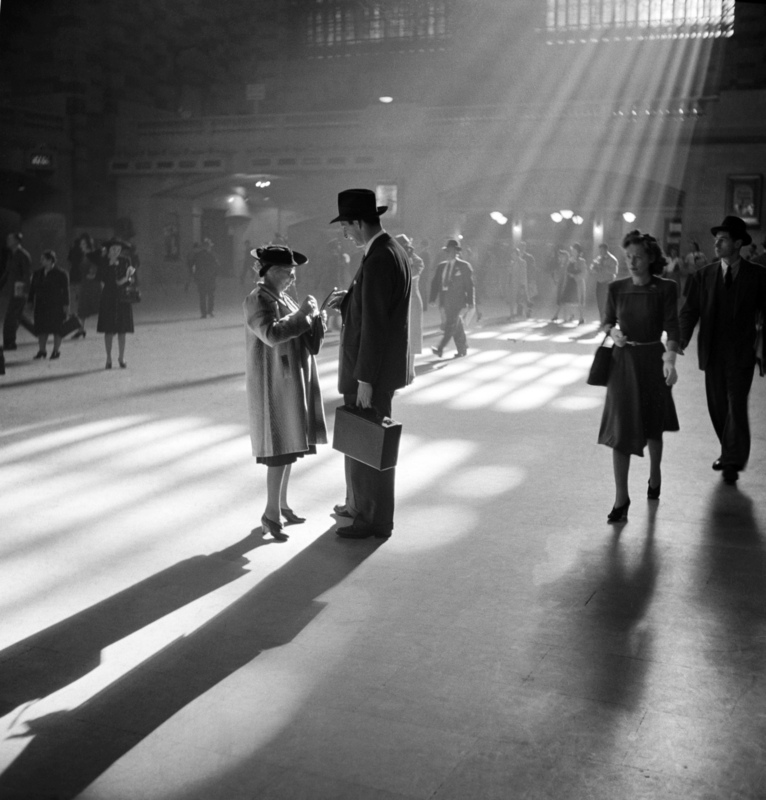 A man and woman talk together in Grand Central's main concourse in October 1941. And the original architects created an unerring sense of passenger flow, with ramps and elevators going from the streets to the platforms. Metro-North President Howard Permut commutes into Grand Central every day from the northern suburbs. "All you have to do is walk in or stand on the balcony and watch people move, and you'll recognize the genius of the people who built Grand Central," Permut says. "To see this phenomenal room and all these movements and almost no one ever bumps into anyone else — it's really amazing." For much of its life, Grand Central accommodated long-distance trains. Probably the most famous of them was the 20th Century Limited, to Chicago. It offered travelers not only fine dining and air-conditioned sleeping cars, but private secretaries, a barber shop and a beauty salon, says Brucker. "It left on its own special platform on Track 34 — huge, wide platform with no columns, where they could roll out the red carpet," Brucker says. But in the 1960s, the New York Central was bankrupt, and there was a real possibility that Grand Central would be torn down and replaced by a skyscraper. There was a public outcry, and Jacqueline Kennedy Onassis joined the fight to save the building, says Brucker. "With her wherewithal, that fight got enough traction to make its way up to the United States Supreme Court, which helped establish a landmarks conservancy act. 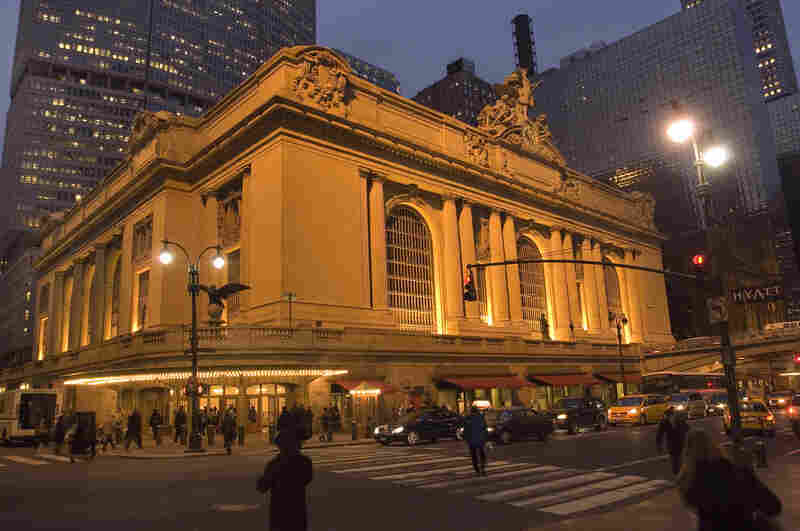 Grand Central Terminal was the first building ever saved under that conservancy act." "Grand Central Terminal was the first building ever saved under [the landmarks] conservancy act," explains tour guide Daniel Brucker. The terminal was saved, but it was in terrible shape. Metro-North raised half a billion dollars in bonds to restore Grand Central to better than new conditions in the 1990s. They drained a quarry in Italy to get marble to match the original. They spent a year painstakingly cleaning the black tar off the ceiling. They added a food court, a fresh food market and high-end stores. And now? "[It's] one of the top 10 visited sites in the world," Brucker says. "And the shopping alone — it's one of the most successful and vibrant shopping areas in the U.S. So, it is a testament to rebirth and to renewal and to reimagination." And it will only become busier by the end of the decade, Brucker says. "As we are speaking, the Long Island Railroad, one of the nation's largest railroads — a sister railroad of Metro-North — is burying in the deepest tunnels on planet Earth for trains, burying into Grand Central Terminal to build a terminal under this terminal!" 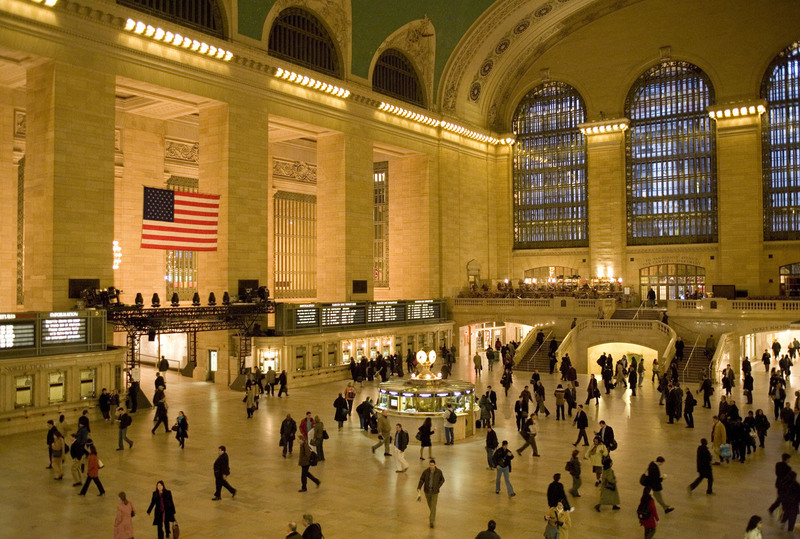 A special ceremony will mark Grand Central's centennial on Friday.